19534 Diomedes Devoured by his Horses 1865 oil on canvas Mus? ?e des beaux-arts, Rouen. 59957 Europa and the Bull Europa and the Bull (1869). 19538 Hercules and the Lernaean Hydra 1869-76 oil on canvas The Art Institute of Chicago. 10946 Hesiod and the Muse 1891. 1' 11 1/4" x 1' 1 1/2" (59 x 34.5 cm). Gift of Etienne Blanc, 1961. 19535 Hesiod and the Muses oil on canvas Mus? ?e Gustave Moreau, Paris. 10947 Jason salon of 1865. 6' 8 1/4" x 3' 9 1/2" ( 204 x 115.5 cm ). Gift of Theodore Reinach, 1908. 56977 Jupiter and Semele mk250 around the year 1875. Oil on canvas, 213.4 x 101.6 cm. Balimoluo Museum. 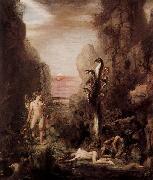 68538 Moreau Jason et Medee, par Gustave Moreau (1865). Huile sur toile, 204 x 121,5 cm. Musee d? ?Orsay, Paris, France. 19532 Oedipus and the Sphinx 1864 oil on canvas Metropolitan Museum of Art, NY. 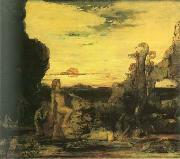 19533 Orpheus 1865 oil on panel Mus? ?e d'Orsay, Paris. 19530 Pieta 1854 oil on canvas Museum of Fine Arts, Gifu. 19536 Prometheus 1868 oil on canvas Mus? ?e Gustave Moreau, Paris. 19539 Saint George and the Dragon 1870-89 oil on canvas The National Gallery, London. 19537 Saint Sebastian and the Holy Women 1868-69 oil on panel Saint Louis Art Museum, MO. 19541 Salome Dancing before Herod 1874-76 oil on canvas The Armad Hammer Collection, Los Angeles. 19540 Sappho 1871-72 watercolor on paper Victoria and Albert Museum, London. 70814 See below 204 x 121,5 cm. 19529 Self-Portrait 1850 oil on canvas Mus? ?e Gustave Moreau, Paris. 19542 The Apparition 1874-76 watercolor on paper Mus? ?e du Louvre, Paris. 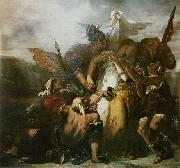 French 1826-1898 Moreau's main focus was the illustration of biblical and mythological figures. As a painter of literary ideas rather than visual images, he appealed to the imaginations of some Symbolist writers and artists, who saw him as a precursor to their movement. His father, Louis Jean Marie Moreau, was an architect, who recognized his talent. His mother was Adele Pauline des Moutiers. Moreau studied under François-Édouard Picot and became a friend of Th? ?odore Chass? ?riau, whose work strongly influenced his own. Moreau carried on a deeply personal 25-year relationship, possibly romantic, with Adelaide-Alexandrine Dureux, a woman whom he drew several times. His first painting was a Piet?? which is now located in the cathedral at Angoul??me. 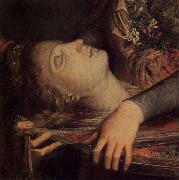 He showed A Scene from the Song of Songs and The Death of Darius in the Salon of 1853. In 1853 he contributed Athenians with the Minotaur and Moses Putting Off his Sandals within Sight of the Promised Land to the Great Exhibition. 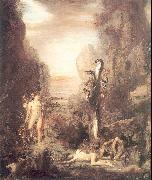 Oedipus and the Sphinx, one of his first symbolist paintings, was exhibited at the Salon of 1864. Over his lifetime, he produced over 8,000 paintings, watercolors and drawings, many of which are on display in Paris' Mus? ?e national Gustave Moreau at 14, rue de la Rochefoucauld (IXe arrondissement). The museum is in his former workshop, and was opened to the public in 1903. Andr?? Breton famously used to "haunt" the museum and regarded Moreau as a precursor to Surrealism. He had become a professor at Paris' École des Beaux-Arts in 1891 and counted among his many students the fauvist painters, Henri Matisse and Georges Rouault. Moreau is buried in Paris' Cimeti? ?re de Montmartre. In Alan Moore's graphic novel, The League of Extraordinary Gentlemen, it is implied that he was a nephew of Doctor Moreau, and he based a few of his paintings on the Doctor's creations.